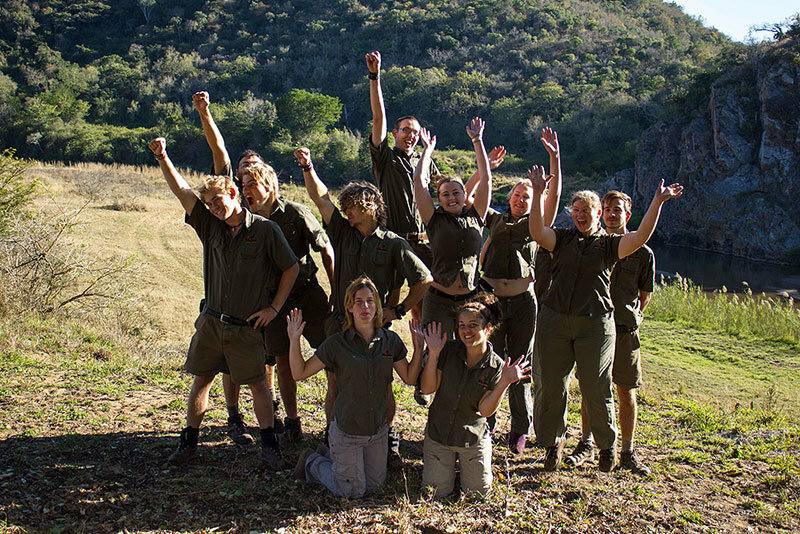 Bhejane Nature Training is owned and run by Dylan and Christa Panos and a passionate team of academic, field and camp staff. Recognizing the need for accredited nature guide training providers in Northern KwaZulu Natal, Bhejane Nature Training was started in 2009 by Dylan and Christa. uBhejane is the Zulu name for the African Black Rhino, a flagship species for northern KwaZulu Natal. Bhejane Nature Training is the first training provider to launch a comprehensive career programme for guides, and our 3 year Advanced Nature Guiding and Wildlife Conservation programme, can be recognised as the most comprehensive training programme of its kind for nature guides. This programme focuses on both terrestrial and marine environments and prepares students for various possible career paths in the wildlife tourism and conservation industries. We aim to provide students with a training and education environment that promotes internal growth and development beyond career goals. Our students are encouraged to become goal driven individuals with a strong character and proud work ethic. While there are various conservation and tourism diploma courses available, there is no comprehensive diploma course available for students that are serious about a career as a professional nature guide. Many guides complete short courses,only to spend two fleeting years in an industry for which they are not adequately prepared in order to sufficiently grow and promote themselves. In addition, school leavers may find that after completing a shorter course, they are not yet able to start working as they have to wait to turn 21 to register as a guide. By completing this 3 year programme, you are guaranteed to enter the job market as an exceptionally qualified guide with current and relevant experience and a level of competence that far exceeds that of other entry level guides. The Bhejane Nature Guiding and Wildlife Conservation 3 Year programme, is the only one of its kind in the industry, and has been developed to most accurately meet the demands of the Wildlife Tourism Industry for the employment of Professional Guides, Conservation Research and Field Assistants, and conservation entrepreneurs. Please note that International Students pay an additional levy of 5% on the course fee for each year. Subject to successful completion of all modules and chosen electives. Must be able to swim 100m unaided. The 1 Year Professional Nature Guide Course prepares students for active participation in the Wildlife Tourism industry, by developing competent guides, with well formulated career paths in the various specialist guiding fields. This includes a good knowledge of the environment, communication and interpretative skill, entrepreneurial skill and most importantly, a positive and enthusiastic attitude. The course has been structured to include the national skills programmes as required by the South African Tourism Act, to be recognized and registered as a legal nature guide. These skills programmes are trained using the syllabus of the Field Guides Association of Southern Africa. In addition to these skills programmes, we have added components and Practical Guiding Skills that address areas of essential knowledge that is not included in the skills programmes above. This includes various topics such as the Guiding Career Path, Areas of Specialization, General Knowledge for Guides, coping skills for working in lodge and other guiding environments, research and reference skills, correct use of equipment, guest etiquette, discussing controversial conservation topics with guests, vehicle skills and various life skills such as self confidence, leadership and communication. We focus not only on the mainstream field guiding skills needed for guiding at upmarket lodges on Big 5 reserves, but also introduce you to new emerging niche eco-tourism markets such as Birding, Butterflying and Marine Guiding. Eco-tourists are by definition well educated and always looking for new and authentic experiences. While there are many guides available for the traditional Big 5 guided experience, there is a growing demand for guides with some specialised knowledge that can guide tourists “off the beaten track”. We will give you the competitive advantage by providing you with training that can be used to later specialise in your chosen field of interest. This programme is also a good introduction to our more comprehensive 3 year programme. The Level 1 Nature Guide Qualification is the most sought after qualification required by the guiding industry for employment. The FGASA Level 1 Course also contains the CATHSSETA Nature Site Guide qualification, which is the minimum requirement for guides to register as legal tourist guides in South Africa. Beyond Southern Africa’s borders, the higher standard of the FGASA qualification also enjoys recognition in many other countries on and off the African Continent. While we recommend the longer 1 year or 3 year courses for school leavers, the 10 week course is ideal for older students that have already got some relevant life and work experience. The course is also ideal for Nature Conservation, Reserve Management , Zoology or Tourism Graduates that want to increase their employability. Bhejane now also offer a new Combined Marine and Nature Guiding Course during which both the Nature Guide Level 1 and Marine Level 1 qualifications are trained. Contact us for more information about this course. Subject to successful completion of all modules. To ensure long term employability, the Trails Guide qualification is the next logical step after completing your FGASA Level 1 training. The Trails Guide course includes advanced practical guiding skills that relate to navigation and orientation, guiding ethics, preventing and dealing with emergencies on trail, planning and conducting a guided trails experience , tracking skills and animal behaviour ,Basic and Advanced Rifle handling and approaching dangerous game on foot. Qualified trails guides are very sought after in the industry , making this an essential qualification to give you a competitive advantage. Bhejane offers Back-up Trails Guide courses for students with no experience, as well as shorter experience courses for qualified guides that are working towards their full trails qualifications. Courses may be extended with up to 1 week to ensure adequate assessment time. Encounters, ARH Assessment and Experience – charged per day – please enquire. Bhejane Nature Training is situated in northern KwaZulu Natal and conduct training courses across a diverse range of habitats in Zululand and along the Maputaland Coast. We are based in an area that is recognized as a global biodiversity hot- spot and contains some of the oldest conservation areas in the whole of Africa. The diversity of the area is the result of varied habitats and biomes coming together in rich tapestry of landscapes. Bhejane Base Camp accommodates students in Safari Tents with shared living areas. Living areas comprise of ablution facilities and study areas, as well as a student kitchen where you can prepare meals over weekends and off days. Your course prospectus will contain more detailed information about the facilities at camp. During practical field trips we make use of a variety of camps where accommodation varies between huts, dorms or tents. While all meals are prepared for you at the Base Camp, students all assist with meal preparation while we are travelling. Stationery Bring pens, pencils, pocket sized notepads and A4 notebook, which are essential for taking notes during class and on practicals. All other learning materials will be supplied. Any reference / field guide books you may have.